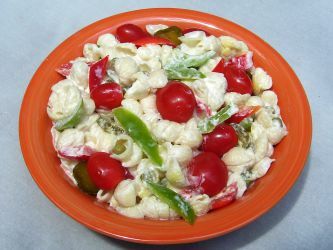 Cold Pasta Salad Recipe Easy is a combination of pasta and vegetables with a creamy Homemade Dressing. Add one of the suggested ingredients to make it a main dish for a luncheon or any light meal. Cook pasta according to package instructions until it is as tender as you prefer. Drain. Rinse in cold water and let cool completely before assembling your salad. Cut your vegetables except the tomatoes. Reserve a few of the tomatoes to garnish the top. To assemble your salad, place cold pasta in a salad bowl and pour your chilled dressing over it and toss lightly. Serve immediately or chill all together before serving. Mix all together and place in refrigerator until pasta is done and vegetables are prepared. *If you are limiting your salt intake, you may reduce the salt by 50% or omit it. The reason for so much salt is because most of the salt cooked with the pasta will wash away when you drain your cooked pasta and rinse it. Serve on salad greens of your choice on a plate or in individual salad bowls. Add a cup of diced cooked ham or chicken (chicken breast are lovely) to make a light main dish. Add a can (4.5 oz.) of tuna, drained. If using tuna packed in oil, you can choose not to drain it. The olive oil in the packed tuna is healthy, in my opinion. Plus, it adds to the flavor of the salad. Add 1/2 cup chopped boiled eggs. Or use sliced boiled eggs for garnish. Add 1/3 cup Blue Cheese to the Salad Dressing. This is an excellent salad to pack and take to work. You can pack this it at home in Twist and Seal Containers to have a quick, simple lunch whenever you want it or when your guests drop by and you don't feel like cooking in sweltering heat.